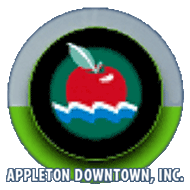 The 44th Annual Downtown Appleton Christmas Parade will be Tuesday, Nov. 25, 2014. This year's theme is "The Avenue of Lights." The Parade will begin at 6:30 p.m. at the corner of State St. and College Ave. It will head east on College Ave. to Drew St. 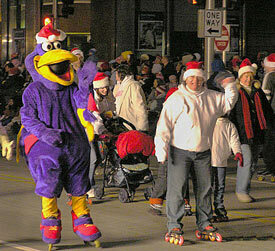 The Appleton Downtown Christmas Parade is the largest nighttime parade in the Midwest. Last year's parade drew approximately 80,000 spectators to Downtown Appleton. "The Appleton Parade Committee selects individuals who have made a positive impact on the downtown area to serve as Parade Marshals. 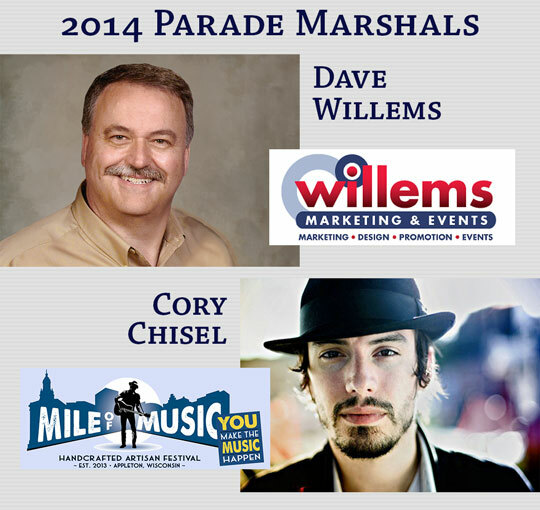 We are pleased to honor Dave Willems and Corey Chisel this year. The Mile of Music downtown festival they co-founded has quickly become a major event for all of the Fox Cities area." After growing up in Green Bay and working for the Green Bay Packers during his college years at UWGB, Dave served as PR Director for five years for a Milwaukee-based promotion company where he worked with many industries, including the music and sponsorship fields. He began his first marketing business in 1989 in Appleton, and has been a community advocate for the past 25 years in the Fox Cities. Willems Marketing is owned by Dave and his brother, Paul Willems of Green Bay, and the firm is celebrating 15 years in business this month. Willems Marketing & Events is located in Downtown Appleton and has contributed more than $1.5 million dollars in marketing services to community organizations during its 15 years. Dave’s wife, Mary, and their two college-aged children, Kim and Paul, have all worked on both Mile of Music festivals from a coordination, marketing and social media standpoint. Born in Babbitt, Minnesota, Cory’s family moved to Appleton when he was 7. He considers Appleton – where he spent his formative years, participated in the Appleton Boy Choir and began his musical journey – to be his hometown. Now based in Nashville, Cory is currently working on two new records. He has also worked on recent records with the likes of Rosanne Cash and Emmy Lou Harris. As the Music Curator for Mile of Music, he continues to reach out to performers from Nashville, Austin and the Coasts to share the story of his hometown music festival and invite them to join in. Cory will again be hosting his popular “An Evening of Holiday Mischief” concert on Dec. 18th at the Lawrence Memorial Chapel in conjunction with Mile of Music and Appleton Downtown Incorporated. Cory’s partner, Adriel Denae, has performed at both Festivals and they recently welcomed a new addition, a baby boy – Rhodes Wilder Chisel. Mile of Music started with a 2012 phone call from Dave Willems to Cory Chisel. Did Cory want to help start a new music festival in Appleton? He did. Cory lined up performers. Dave secured backing and venues. In summer of the next year, Mile of Music debuted with 100 original music acts and over 200 live performances in Downtown Appleton. This summer saw the festival, dubbed Mile 2, entertain 30,000 people with 218 artists in over 600 live performances at 60 venues. Venues ranged from small restaurants to the Performing Arts Center and the Lawrence Memorial Chapel to a city bus outfitted as the Mile of Music bus that presented live performances while it drove around the downtown area. Most of the music was free. Many of the artists are emerging performers, but well known participants have included Norah Jones, Rodney Crowell, Richie Ramone, and Mike Mills from REM. Plans are now taking shape for next August’s Mile 3, which will be bigger and better – with both fresh and favorite artists, a mystery stage for kids, surprise pop-up acts, and more visual arts to complement the music. This handcrafted, artisan music event will continue to support two main community efforts: funding music education projects in Appleton public schools and supporting creative projects in Downtown Appleton. 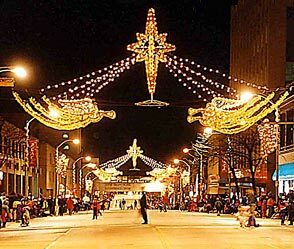 Each year, over 80,000 spectators attend the Annual Downtown Appleton Christmas Parade. Due to unavoidable programming conflicts, this year’s parade will not be televised live on WFRV-TV. Local Channel 5 will videotape the parade for showing on two subsequent dates: Thursday, Nov. 27 from 6:30-8:00 pm with a second telecast on Saturday, Nov. 29 from 11:00 am–12:30 pm. The 1-mile run starts about 1/2 hour prior to the 44th Annual Downtown Appleton Christmas Parade and proceeds down College to Drew St., finishing at Jones Park. No roller blades. No pets please. 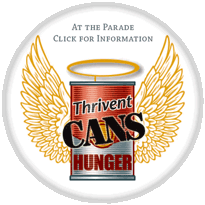 Thrivent will be collecting donations of canned goods for their "Thrivent Cans Hunger" food drive. For information go here. APPLETON CHRISTMAS TREE LIGHTING AFTER PARADE. To celebrate the Christmas season, Appvion will sponsor the Annual City of Appleton Christmas Tree Lighting Ceremony in City Park at approximately 7:45 p.m. immediately following the Christmas Parade. The event will include members of the Appleton Boychoir with a special appearance by Cory Chisel. There will be Christmas carols, live animals, and Santa & Mrs. Claus handing out candy canes to the children. Additional music will be provided by Legend George. The public is invited to attend. The Appvion website is here. Bill Fischer always believed in downtown Appleton and he whole-heartedly enjoyed the Christmas Holiday season. So when he was presented with the opportunity to be part of the Downtown Appleton Christmas parade, Bill was all in. He started in retail at Appleton's first department store, Gloudeman's. In 1969, he and wife Janet formed their own College Avenue retail store: Fischer's Boyswear. Bill was honored and humbled to be Parade Marshall of the Christmas Parade twice. Over the years, Bill saw the evolution of The Avenue. What once was the retail hub of the community went through changes until its recent emergence as a vibrant entertainment destination with an eclectic mix of restaurants, retail offices, Saturday Farmer's market, the Thursday night concerts, and more. The "Avenue of Angels" brought joy and pride to Bill and his family. 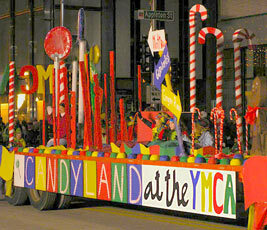 For many years, Bill walked alongside of the final float in the parade — the Santa float. It gave him joy to see the bundled-up children waving and smiling frantically at Santa, the star of the Parade. This year Bill Fischer will be a star in the sky, twinkling above the Avenue of Angels. Sharon Hibbard carried this philosophy with her throughout her 27 year career at Cleo’s bar in downtown Appleton. She was a fixture there, often called Mom. Friends speak highly of her compassion and sympathy. It made her sad to know people would have to spend Christmas alone. The Downtown Appleton Christmas Parade was one of her favorite days. She would spend weeks planning a pre-parade gathering at her downtown apartment. All were welcome, especially children. The party grew over the years as her son moved his business to College Avenue in Appleton. There would be presents for all the children, Tables of food, and cocktails for the adults. Her signature drink for the parade was hot chocolate with a candy cane, with marshmallows as whipped cream. For adults, a splash of peppermint schnapps. When all were served, Sharon dashed outside to catch the parade. The time she cherished most was when the Avenue of Angels lit up, the bands started playing, and the floats began coming by — with her snuggled in a chair, surrounded by her grandchildren. As she told the children who shared their Christmas lists with her: You have to believe to receive.